So what exactly is this Feynman technique? Does it have a set of hard and fast rules? Let’s see to that in greater details in this article. Richard Feynman, a celebrated physicist was the inventor of this technique. He was also widely known to be a great explainer of things because of his exceptional ability to explain things in the best possible way. The Feynman method of learning is considered to be an active form of learning. It can help students comprehend, explain and recall the subject (it can be ANYTHING, ANY topic) within a short amount of time. The first and the foremost thing to do is to choose a concept. Explain the concept to yourself (or to somebody else) as if you’re explaining it to a layman (says a 5-year old kid). Point out any knowledge gap (if any). Use some sort of an analogy. I have already highlighted the 5 steps in my previous paragraph. In here, I will just explain it further. ANY topic! The Feynman technique doesn’t have any limitations. It’s not like it’ll work only for science subjects and nothing else. No! It is equally efficient. So make your choice freely. This is the real deal. This is the place where you are compelled to simplify entire concepts such that even a child can understand it. By forcing yourself to do that, you are actually simplifying the entire thing for your very own benefits. Is there any knowledge gap? Find out whether there’s any knowledge gap in your possible explanations. If there’s any, pinpoint them. Go back to the matter and clear them up. Feynman nursed this belief that if something can’t be explained in layman’s terms, there’s a problem with his comprehension, not with the information. If your concept is abstract and is something that’s not so easily relatable to the physical world, it’s advisable to create some sort of an analogy to make it more relatable? Why should you do it? Do you think that a 5 year old child can understand abstract concepts with bare ease? The entire motto of the Feynman technique is to render the subject in such a manner that even a child can understand it. Naturally an analogy becomes some sort of a necessity, rather than a luxury. If the concept appears too difficult to your liking, it might do you more good to lose some details. Still difficult? Lose some more but simplify it nonetheless. It will definitely benefit you in the long run; there’s no doubt about it. 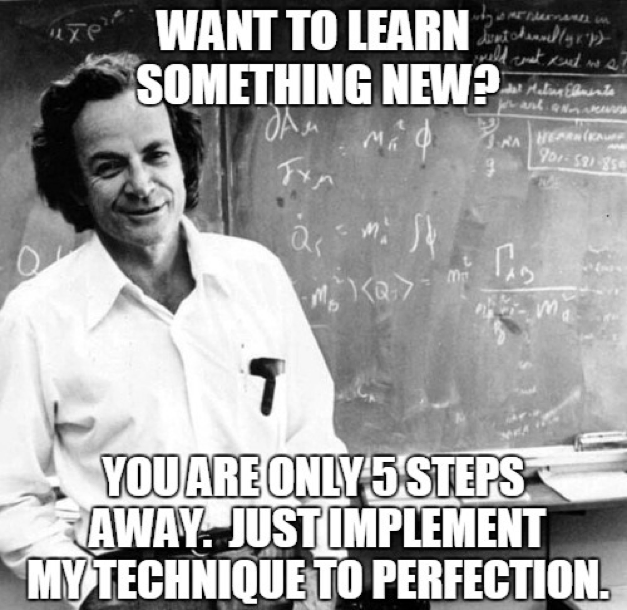 Why should you incorporate the Feynman method of learning in your studies? According to Richard Feynman, leaning is not about memorizing a bunch of facts and figures however difficult it might appear to be. It’s all about making difficult things easier. The Feynman technique can be used to great effects for doing the exact same things mentioned above. There are no subject restrictions as well. From quantum physics to basic arithmetic, the Feynman technique can be used to learn anything from A to Z to near-enough perfection. Honestly, can you fault his reasons that are stated in that quote of his? If you can, don’t hesitate to mention them in the comments sections below. I will be looking forward to it.